I however, am intrigued by Menzies’ claims, and eager to see and hear more. Whether Menzies’ claims are true will hopefully become clear over time. What dismays me about Menzies’ self-styled “debunkers” is not their intellectual disagreement, but their emotional outrage. Leave aside for the moment whether Menzies’ answers to these questions are correct. Turn instead to why Menzies’ “debunkers” are so affronted that such questions would even be asked. Leave aside for a moment history, and turn to psychology. Read their “rebuttals.” Read between the lines. Note the hysterical tone of some of their responses. Why are these mainstream Western academics and intellectuals so offended by the idea that a Chinese navigator, rather than an Italian navigator, first discovered America, or that a Chinese navigator, rather than a Portuguese navigator, first circumnavigated the globe? Has a sacred cow been gored? Has an article of faith been questioned? Has their comfortable Eurocentric world view been shaken to its very foundations? In the cult science fiction film The Planet of the Apes (1968, directed by Franklin J. Schaffner, written by Pierre Boulle, Michael Wilson, and Rod Serling) we humans got a sense of what it would be like if apes were to replace us at the top of the food chain. We humans were aghast as we watched apes rule the planet. I get the feeling that Menzies’ “debunkers” feel the same way about the suggestion that Chinese navigator Zheng He discovered America and circumnavigated the world. These mainstream Western academics and intellectuals seem unwilling to admit into their consciousness the very thought of a world in which Westerners are not the driving force behind every major event in history. These mainstream Western academics and intellectuals seem unwilling to countenance the very idea of a world stage on which Westerners are not the leading men and leading ladies, and non-Westerners are not the bit players. Whether Menzies’ claims will ever be substantiated is one thing. But the shrilly defensive reaction from Western “Defenders of Civilization as We Know It” is something else altogether. 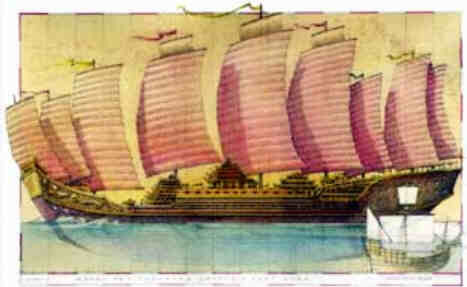 The size of Zheng He’s ships may have been exaggerated. I don’t know. But suppose they were? Zheng He’s ships could have been far smaller than Menzies postulates, and still sailed to America, or even circumnavigated the globe. After all, Columbus and Magellan managed to perform these feats using far smaller ships. Why couldn’t Zheng He have performed them, only earlier? Ming dynasty maritime technology was more than capable of accomplishing these feats. Whether Chinese navigators bothered to carry them out is a separate matter. We are delighted to enclose below an excerpt from Gavin’s new book, 1434: The Year a Magnificent Chinese Fleet Sailed to Italy and Ignited the Renaissance. One thing that greatly puzzled me when writing 1421 was the lack of curiosity among many professional historians. 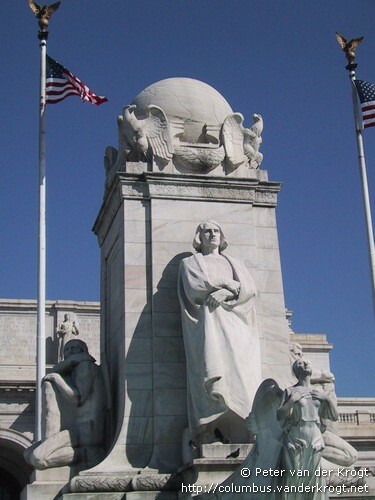 After all, Christopher Columbus supposedly discovered America in 1492. Yet 18 years before he set sail, Columbus had a map of the Americas, which he later acknowledged in his logs. Indeed, even before his first voyage, Columbus signed a contract with the King and Queen of Spain that appointed him Viceroy of the Americas. His fellow ship’s captain, Pinzon, who sailed with him in 1492 had too seen a map of the Americas — in the Pope’s library. How do you discover a place for which you already have a map? The same question could be asked of Magellan. The straits that connect the Atlantic to the Pacific bear the great Portuguese explorer’s name. When Magellan reached those straits, he had run out of food and his sailors were reduced to eating rats. Worse, they were convinced they were lost. Why were the straits named after Magellan when Magellan had seen them on a chart before he set sail? Once again, it doesn’t make sense. The great European explorers were brave and determined men. But they discovered nothing. 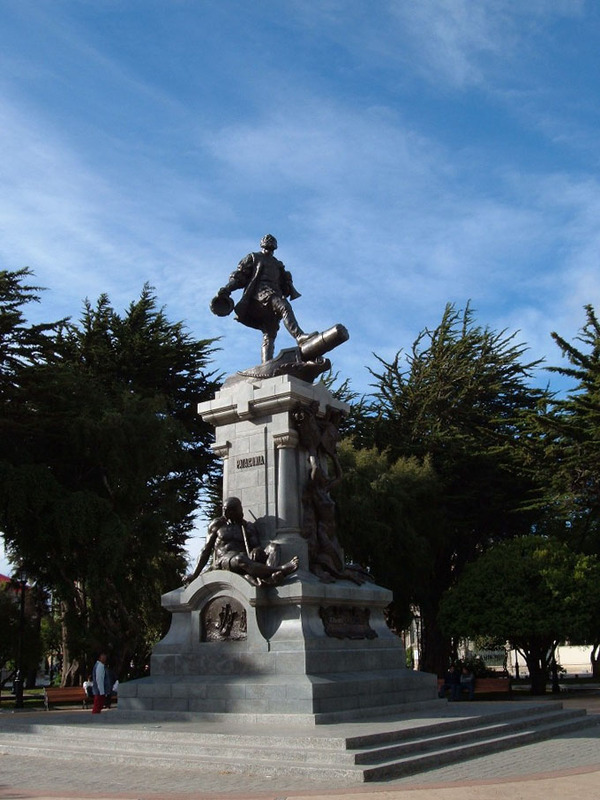 Magellan was not the first to circumnavigate the globe nor was Columbus the first to discover the Americas So why, we may ask, do historians persist in propagating this fantasy? Why is the “Times History of Exploration,” which details the discoveries of European explorers, still taught in schools? Why are the young so insistently misled? After 1421 was published, we set up our website, http://www.1421.tv, which has since received millions of visitors. Additionally we have received hundreds of thousands of emails from readers of 1421, many bringing new evidence to our attention. Of the criticism we’ve also received, the most frequent complaint has concerned my failure to describe the Chinese fleets’ visits to Europe when the Renaissance was just getting underway. Two years ago, a Chinese Canadian scholar, Tai Peng Wang, discovered Chinese and Italian records showing beyond a doubt that Chinese delegations had reached Italy during the reigns of Zhu Di (1403 – 1425) and the Xuande Emperor (1426 – 1435). Naturally, this was of the greatest interest to me and the 1421 team. Shortly after Tai Peng Wang’s 2005 discovery, Marcella and I set off with friends for Spain. For a decade, we’ve enjoyed holidays with this same group of friends, travelling to seemingly inaccessible places – crossing the Andes, Himalayas and Hindu Kush, voyaging down the Amazon, journeying to the glaciers of Patagonia and to the High Altiplano of Bolivia. In 2005 we walked the Via de la Plata from Seville, from which the Conquistadores sailed to the New World, north to their homeland of Extremadura. Along the way, we visited the towns in which the Conquistadores were born and grew up. One of these was Toledo, painted with such bravura by El Greco. Of particular interest to me were the mediaeval pumps by which this fortified mountain town drew its water from the river far below. On a lovely autumn day, we walked uphill to the great cathedral that dominates Toledo and the surrounding countryside. We dumped our bags in a small hotel built into the cathedral walls and set off to explore. In a neighbouring Moorish palace there was an exhibition dedicated to Leonardo da Vinci and his Madrid codices, focusing on Leonardo’s pumps, aqueducts, locks and canals — all highly relevant to Toledo. This note puzzled me. I had been taught that Leonardo had designed the first European canals and locks, that he was the first to illustrate pumps and fountains. So what relevant training had he received from di Giorgio, a name completely unknown to me? I learned that di Giorgio had inherited notebooks and treatises from another Italian, Mario di Jacopo ditto Taccola (called Taccola “the jackdaw”). Taccola was a clerk of public works living in Siena. Having never seen the sea or fought a battle, he nevertheless managed to draw a wide variety of nautical machines – paddle wheeled boats, frogmen and machines for lifting wrecks together with a range of gunpowder weapons, even an advanced method of making gunpowder. It seems Taccola was responsible for nearly every technical illustration that di Giorgio and Leonardo had later improved upon. So, once again, we confront our familiar puzzle: How did a clerk in a remote Italian hill town, a man who had never travelled abroad nor obtained a university education, come to produce technical illustrations of such amazing machines? This book attempts to answer that and a few related riddles. In doing so, we stumble upon the map of the Americas that Taccola’s contemporary, Paolo Toscanelli, sent to both Christopher Columbus and the King of Portugal, in whose library Magellan encountered it. The first three chapters of this book describe the two years of preparations in China and Indonesia to fulfil that order, which required launching and provisioning the greatest fleet the world had ever seen for a voyage across the world. Chapter 4 explains how the Chinese calculated longitude without clocks and latitude without sextants -prerequisites for drawing accurate maps of new lands. Chapters 5 and 6 describe how the fleet left the Malabar Coast of India, sailed to the canal linking the Nile to the Red Sea, then down the Nile into the Mediterranean. Some have argued that no Chinese records exist to suggest Zheng He’s fleets ever left the Indian Ocean. Chapters 5 and 6 document the many records in China, Egypt, Dalmatia, Venice, Florence and the Papacy describing the fleets’ voyage. In Chapter 21, I discuss the immense transfer of knowledge that took place in 1434 between China and Europe. This knowledge originated with a people who, over a thousand years, had created an advanced civilisation in Asia; it was given to Europe just as she was emerging from a millennium of stagnation following the fall of the Roman Empire. The Renaissance has traditionally been portrayed as a rebirth of the classical civilisations of Greece and Rome. It seems to me the time has come to reappraise this Eurocentric view of history. While the ideals of Greece and Rome played an important role in the Renaissance, I submit that the transfer of Chinese intellectual capital to Europe was the spark that set the Renaissance ablaze. When you have read the book, please tell us whether you agree. Interesting comments on attitudes from white historians. I just wanted to comment on Planet of the Apes….It is interesting to note that the French writer, Pierre Boulle, was using apes as an allegory for the Japanese in WWII. You see, he was a French colonialist that was kicked out of SE Asia by the Japanese, and was outraged that these “apes” would dare usurp the rightful place of white men in Asia. Mr. Chu,One thing I think you all to easily overlook is the fact that most western scholars who study Asia do so because they are absolutely fascinated by it. Yet, you consistently portray Western scholars as charlatans who’ve come to Asia for the sole purpose of proving themselves right about their own superiority. It just doesn’t work that way. Not only do most western scholars in Asia think China, Japan, Taiwan, etc. are far more interesting than Europe and the Americas, they come back and extol Asian technological advances throughout history. It has become apparent to most the world that Europeans coming back from Asia likely sparked the Renaissance. Whether it was Zheng He’s actual arrival in Europe, though, is certainly debatable. In any case, Asian technological superiority was key.The only reason I’m aware of Zheng He and China’s technological superiority throughout history is as a result of the western scholars who studied there over the last several centuries. These historians who are attacking Menzies aren’t (as a group) a symbol of western attempts to hide history. Sure, there very well could be a few who harbor some imbecilic belief in western superiority, but you presented nothing to prove that. The fact is, historians are the way they are because academics tend to always think they’re right. They’re arrogant and stubborn, no matter which side of the planet they’re from and no matter their area of study. Many valid questions have been raised about Menzies research and conclusions, and it’s just too facile for you to blame it on some western conspiracy to hold back the truth. There is probably no historical figure in Chinese history that interests me more than Zheng He. I’ve not had the opportunity to study him in as much depth as I hope I soon will, but, when I do, I hope I’ll be honest enough with myself to get past the pomposity of academic debate and focus on the reasoned arguments. 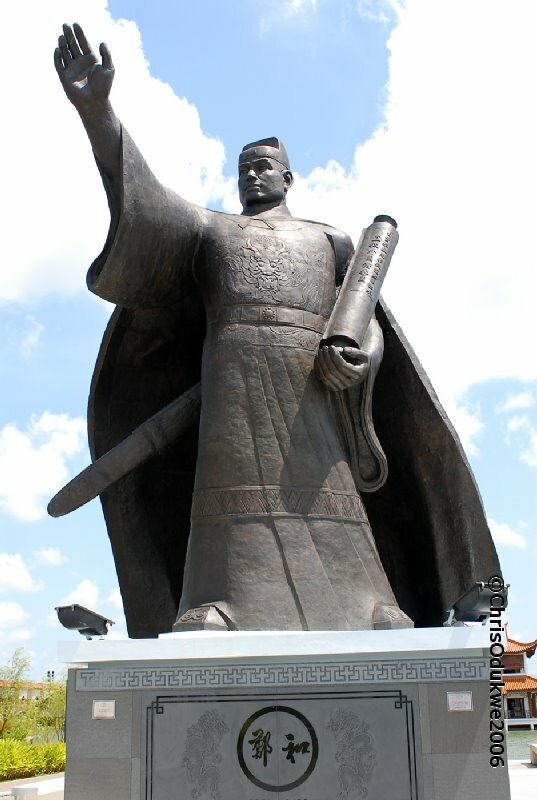 Hell, Zheng He could have made it all the way to Charleston, South Carolina. When I was there recently, someone mentioned they had found an engraved tool in the marsh that a historian at the local university had said was probably from a 15th century Chinese junk. Nobody seemed to worried about the implications that had on their eurocentric POV of history.